I know it seems as if I can't stick to my manufacturing, anti-Rust Belt term, suburb-biased blog. That's because . . .
. . . I can't. 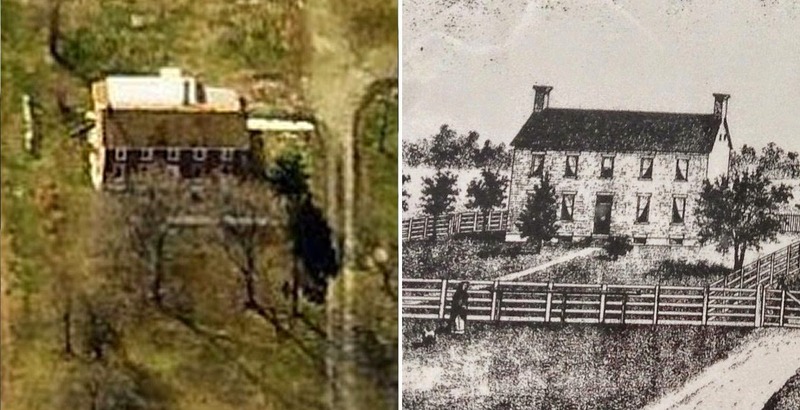 Above is a side-by-side comparison of the house of my fourth great grandmother, Phebe Ann (nee Woodmansee) Conway Driskill. At right, is the illustration of her house that appeared in a book published in 1880 titled History of Ross and Highland Counties. Her house was described as being in the western side of Fairfield Township in Highland County. When I drove by a similar house after a family reunion in that area last weekend, I was on a quest to find her house. And I did. The house on the left is from Bing Maps' bird's eye view aerial photo feature. It's on the 6500 block of McVey Road in the western side of Fairfield Township.